Busch Stadium III was the 3rd new stadium I visited since my big trip in 2003, but not the first time I was back in St Louis since then. This Midwest town had become one of my homes away from home. Through various baseball and beer ventures, I had gained a great new group of friends in St Louis that I would visit a few times a year. St Louis is famous for beer, and more specifically Budweiser, which is famous for their brewery (which is worth a visit) and their Clydesdales. However, in my mind, there is great beer in St Louis, but it has absolutely nothing to do with the awful tasting Bud products. Many of my visits to St Louis included trips to see the Cardinals at Busch II, but all of them included various beer fests and functions revolving around Schlafley beer, which to me is amazing. Considering that this is a baseball story, I will thank Dre, my gracious host for putting me up and joining me at the game, where I was happy to find out we could drink some Schlafley beer and not just Bud products. The other strong St Louis baseball tie for me in this game is that I get to see my second least favorite team, the Cardinals (Yankees of course win the prize for least favorite). Although Dre is not a big baseball fan, she will still defend her hometown team, when I root against them, which is fine and appropriate to me. Today’s game would be an interleague game against the Royals, so it was a Show-Me state rivalry that added a bit to the fun and excitement. I, of course, was wearing Royals gear to provide the Cards with anti-support. From a media perspective, the Cardinals fans are famous for their loyalty, which is present with their all-red Cardinals attire and support for their team. However, coming from the Northeast, I am always disappointed in how quiet they are during games. I later came back for one of the 2006 LCS games against the Mets and could not believe how lively the crowd was not in a game that they beat the Mets. I mean this was a championship series and other than their attire, they did not show me much. The four games I saw at Shea during this series were infinitely louder and more exciting from a crowd perspective. Unfortunately, that series ended with Carlos Beltran staring at a called third strike to end the Mets season and allow the Cards to go on to win another World series against the Tigers. 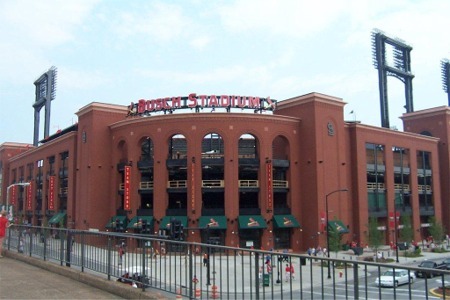 To give a little historical background, this new Busch Stadium opened in April 2006, and replaced the former Busch Stadium, in which the Cardinals played from 1966 until 2005. 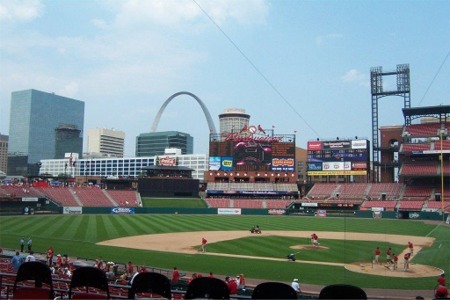 They played in the original Busch Stadium from 1953-1965. The biggest difference with the 3rd Busch Stadium was that this one was a baseball-only facility and had grass instead of turf. Busch II was a typical 1960-1970 cookie-cutter multi-purpose stadium. It was almost identical to Veterans Stadium in Philadelphia, except there were more tributes, plaques and banners to cherish the Cardinals history. 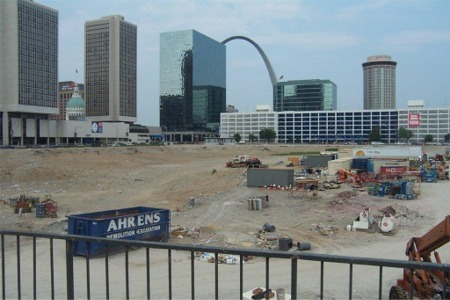 At the time of this visit, I could still see the rubble from the demolished Busch II just across from the new stadium. Like anywhere fans have called home for a long time, they miss the old place, but as an outsider, I think the new stadium is infinitely nicer. The only similarity between the last two Busch Stadiums is the roof, which does look similar and has the flags of all the NL teams on top as well. The newest Busch (III) is far more aesthetically pleasing than the latter. The red brick exterior that can be seen on both sides of the Mississippi is a great look and is appropriately red. There is no doubt in my mind that this is a beautiful Stadium from the outside. They also get their fans and know that Stan “The Man” Musial is the biggest Cardinal icon that exists. Therefore, they have properly erected a statue of this Cardinal great outside the stadium for all to see. They also give tribute to their great players from the past with retired numbers on the right field wall a nd underneath the giant scoreboard. They display their championship seasons and banners on the backside of the giant scoreboard, which can be seen from outside the stadium. They make sure they let everyone know that they are the 2nd winningest franchise in baseball history (as far as championships go). Although, they are clearly not my team, I like the way they remember their history and share it with their fans. To complete that sharing with the fans, all of the seats within the stadium are red like the colors of all the fans clothes. Finally, they still have Big Mac Land in fair territory on the second deck seats to both earn money from advertising McDonalds and celebrating their steroid produced star; Mark McGwire. Regardless of what the rest of the baseball world thinks, the Cardinal fans love him. Like all of the new stadiums, the concourses are wider than the old ones, which is good. There are also more plentiful food and drink options, including Dizzy Dean’s Gas House Grille (in honor of the Gas House Gang teams he played on in the 1930s) Personally, I like getting the toasted Ravioli, which St Louis is famous for, but I have still yet to try their famous turkey leg, but I will someday. Beyond center field, there is the Ford Plaza with the Coca-Cola rooftop deck and scoreboard patio where fans can choose to eat whatever they want. However, my favorite part of the concourses is behind home plate where they kept the old out of town scoreboard from Busch II, as it was when the final out was made. The only bad part was the Mets losing 11-3 to the Rockies is forever ingrained at the Stadium. The only upside, is that the AL scoreboard shows the Red Sox pounding the Yankees 9-1 after 7 innings. From inside the stadium you get a great view of downtown St Louis, but most importantly, you can plainly see the Arch, which is the gateway to the West and the signature structure of St Louis. Regardless of my dislike for the Cardinals, this is a city that I love to visit. 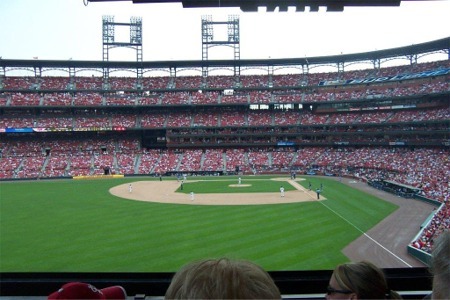 Watching a game is also good, regardless of where you sit, the view is good, because this is a baseball-only stadium, and the seats are angled to give you the best view from any spot in the Stadium. 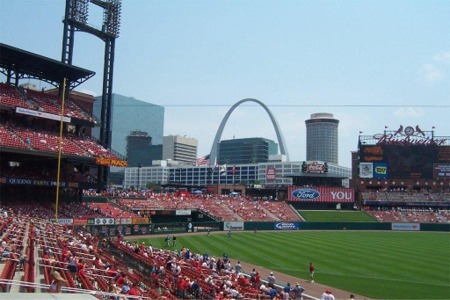 The other thing that is unmistakable in Busch Stadium is that this town is the home of Budweiser. Everywhere you look; there are ads for Bud and all of their associated products. Luckily, for me, I was also able to get Schlafly beer before, during and after the game. From a fan’s perspective you have all the information you need up on the scoreboards. The giant board in right center field always has both team’s lineups displayed, the inning-by-inning scores, game notes and a giant Jumbotron screen for replays and highlights. It also has the giant redbird clock on top and another Bud sign (of course!). The out-of-town scoreboard is in right field and shows the scores of all AL and NL games. It is not as detailed as some of the other new stadiums, but it is good enough for what you need. Considering that this game was played 2 days before Independence Day, our national holiday was celebrated by kicking off the game with an eagle flying onto the field from centerfield, which was a nice touch. As for the game, the Royals got off to a quick start in the first when Emil Brown singled off Jason Marquis to drive home David Dejesus with the first run of the game. That lead would not last though. After holding the Cardinals scoreless for the first 2 frames, Mike Wood was tagged for 5 runs in the 3rd inning. The big blast was Albert Pujols 3-run home run (which set off the stadium fireworks), but Yadier Molina added a 2-run single and Marquis even chipped in with an RBI single to put the Cardinals up 6-1 after 3. In the 5th, the Cardinals plated 2 more runs on back-to-back homers by Scott Rolen and Jim Edmunds, which also knocked Wood out of the game after allowing 8 earned runs on 7 hits, 4 walks, and 1 hit batter, while fanning 4 Cardinals. In continuing my observations on 7th inning stretch traditions, the Cardinals say “root, root, root for the Cardinals” during Take Me Out to the Ball Game, which still leaves the Mets and Yankee fans as the only ones that “root, root, root for the home team”. I have no idea why that is, but it is interesting, nonetheless. Once that was done, they all chime into “Roll out the Barrel”, which does make sense in St Louis. The Royals started to make some noise in the top of the 8th inning. Tony Graffinino singled to drive home Emil Brown with the 2nd Royals run and Reggie Sanders came through with a pinch-hit 2-run single to bring the Royals within 4 at 8-4. This also knocked Marquis out of the game, having allowed 4 earned runs on 9 hits, 1 walk, and 5 strikeouts. However, Albert Pujols would come through again in the bottom half of the 9th by driving home So Taguchi with a single to bump the lead back up to 5 going into the final frame. The Royals would not go down quietly in the 9th though. They scored 3 more times, including RBIs from Mark Teahan and Tony Graffininoo, but when Braden Looper (of Mets infamy) got John Buck to ground out to short, the rally would be over and the Cardinals would be victorious by a final score of 9-7. What started out as a blowout ended up being an exciting game…just too bad the Cardinals had to win the game. Bottom line – Even though the fans are not loud and rambunctious, they do support their team and it is a beautiful Stadium to see baseball and only baseball. It is also a city that I love because of my friends and the atmosphere, so it was a great experience overall.